Armstrong’s walk on the moon constituted the fifth manned mission of the Apollo space program. If nothing else, Apollo 11 will always be remembered as the first space mission that landed humankind on another world. By the time the Apollo 13 mission was to be launched, America had already experienced six successful Apollo missions, with three that had orbited the moon, and two that had successfully landed there. Apollo 13 was slated to be the third manned landing on the lunar surface. Believe it or not – by the time Apollo 13 was launched – we had become somewhat blasé about our manned space program. There was a sense of “been there, done that.” America was already taking these monumental accomplishments for granted; but not for lack of interest in ongoing exploration. Rather (from the perspective of one who viewed the era through the eyes of a child, whose imagination was completely a-glow with any and all possibilities), I remember it as an era when we were absolutely confident in our achievements, and we knew that nothing was out of reach. In fact for so many – the vision was that by the time we hit the year 2000, we’d have colonies on the moon and Mars, and perhaps even had established contact with extraterrestrial intelligence. Everything was possible. Period. And perhaps no other movie captured the idealism of that era better than director, Ron Howard’s Apollo 13. And along with that idealism, there was an unquestioning faith in the unprecedented technological achievements of that time, which was also accompanied by a kind of naivete to the extreme dangers inherent in these missions. If you stop to think about it – how many of us would feel safe today driving the freeways in a new 1970 model car?. (We’re talking just seatbelts, no airbags, no antilock brakes, etc.) Well, now imagine crossing the vastness of space in a capsule designed with technology that was also wholly primitive by today’s standards… Your average smart phone has on a scale thousands of times more power and memory than all the guidance computers aboard the Apollo command and lunar modules combined! Looking back now it was no small miracle landing a man on the moon. And yet, Americans were among the last to know it. We had that much confidence and pride in our space program. And with such pride, ultimately a fall is the price paid. The tragic fiery deaths of three astronauts aboard Apollo 1 during a launch rehearsal represented the first such fall. Apollo 13 became the second, with repercussions that threatened to be as potentially tragic. 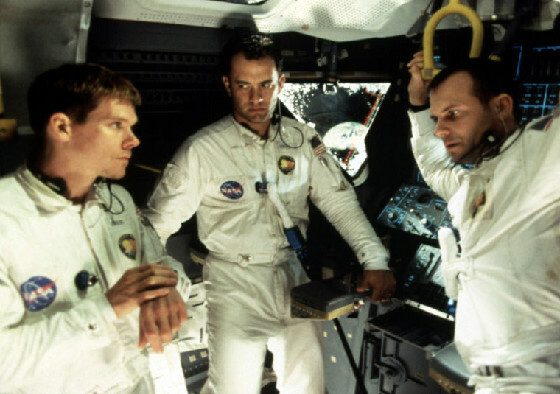 The astronauts aboard Apollo 13 were Mission Commander, James Lovell (played by Tom Hanks), Command Module pilot, Jack Swigirt (played by Kevin Bacon) and Lunar Module pilot, Fred Haise (played by Bill Paxton). Two days after the launch of Apollo 13 an oxygen tank exploded, crippling the service module, which provided both power and air to the central command module. When the service module was no longer able to sustain life aboard the Apollo spacecraft, the Apollo 13 Lunar Module, named The Aquarius, was improvised as the first “life raft” in space. All hope of landing on the moon was abandoned, and Apollo 13’s new mission was to return the astronauts safely to earth against seemingly insurmountable odds. The situation was as dire as anyone could possibly imagine… In fact, no one had imagined the kind of emergency scenario the crew of Apollo 13 confronted. Certainly, the astronauts had rehearsed again and again for all conceivable potential eventualities, but this kind of tragedy went beyond any previous preparation. But no one was ready to give up. The classic quote by Mission Control Flight Director Gene Kranz (played by Ed Harris), “Failure is not an option.” has become a widely recited meme in our culture. Kranz spoke not just for himself, but for the indomitable spirit of that era. His strength of character and leadership also represented the best of the idealism, courage and vision that characterized the American space program of the 1960’s and early 1970’s. Once the press and the world realized that the lives of the three astronauts aboard Apollo 13 were in grave danger, resting on the precipice of what technology could do and couldn’t do, the mission dominated newspaper headlines, television and radio news. The hopes and dreams of not just the United States, but the entire planet now rode along with the beleaguered astronauts. The clip I’ve chosen takes place right after the astronauts have participated in a live television broadcast, which unknown to them was not being carried by any major network, because of the fallen lack of interest in the moon missions. Following this aborted broadcast, Mission Control then instructed the Apollo 13 crew to go though a routine set of technical “housekeeping” adjustments. It was then that they experienced the violent detonation of an oxygen tank that blows a near-fatal hole in the service module… For the first time the United States faced the real fear of astronauts dying in the middle of space forever suspended between the earth and the moon. The Apollo 13 story arch creates what is among the most inspirational movies an audience has ever had the privilege to view. Few motion pictures have the conscious intent to elevate humanity in the manner achieved by Ron Howard in Apollo 13. This is one film, if you haven’t seen, you MUST SEE before you die. Put it on your own cinema bucket list. Apollo 13 is a life affirming experience that will forever make you both appreciate our place in the universe; as well as contemplate that indefinable, divine drive to lift ourselves above this world – despite the tremendous likelihood of death – while summoning a transcendent courage to reach out and explore the ocean of space, whose tides carry the very stardust of our collective origin. The motion picture, “Apollo 13”, is the copyright of its respective owners and its images and clips are used here for informational purposes only.